Welcome to the Goddess Power Oracle! You are invited to experience the wisdom of the Goddesses in this gorgeous, deluxe-packaged oracle deck designed to enhance interactive and meaningful conversations with the Divine Feminine aspect of the Universe. Drawing upon the symbolic energy of many goddesses from ancient cultures around the world–energy that can be reflected in any individual–this Oracle deck provides loving and clear guidance to those who seek it. Learn more & try the Goddess Power Oracle Cards for free. The depiction of the goddesses in this Oracle is non-traditional in order to blur the lines of what’s expected and allow the goddesses to show their archetypal essence–which exists in everyone regardless of culture–while the Oracle leaves room for an evolving story. Welcome to the world of the Spirit Animal Oracle! Nature is the long-lost instrument of divine communication and expression that has lain hidden in plain sight since time began. The world around us is rich with Soul; every animal has a transcendent archetypal symbolism, a universal meaning holding a message of deep, enduring truth. Although like most people, you may have long lost your natural ability to decipher the communication offered to us via the natural world, somewhere inside you is a vestigial memory of a time when a Spirit Animal called to your ancestors. Ancient wisdom keepers knew the symbolism inherent in each animal, insect, bird, or fish, and how their very presence was a form of communication, their movements a sacred language that conveyed layers of truth more than words could ever offer. Your soul remembers, however. You’re invited now to share in this wisdom, with the Spirit Animal Oracle deck, so that you may better navigate your life, move beyond the obstacles of your perceived limitations, and tune in to your infinite potential as you enter a new world of sacred dialogue for practical guidance in your everyday life. The spirits residing in the natural world have much to share, and the secrets of their forgotten language are now available to you. The Mystical Shaman Oracle card deck is the guide that empowers you to open up your connection to the Universe through sacred earth-based symbols. The messages from these universal sacred symbols help expand your self-awareness, become more in tune with your true Self and with and the collective wisdom of the natural world. Using this deck will inspire you to have the courage to transform, claim more beauty and joy in your life, and add to your sense of well being and wholeness in the world. Go the Mystical Shaman Oracle deck page to try out the cards and learn how to get a bonus meditation when you buy! Colette Baron-Reid, oracle expert, has co-created this deck with Alberto Villoldo PHD and Marcela Lobos, who are experts in modern shamanic medicine and ancient indigenous spiritual traditions. It blends ancient shamanic symbols and the art of oracle divination into a practical guide for the modern world. Colette Baron-Reid has expertly blended elements of the I-Ching, Norse runes, traditional tarot, and other ancient divination tools into a sacred communication system: Wisdom of the Oracle. This 52-card deck and companion guidebook will allow you to interpret messages about all aspects of your journey, with over 250 independent meanings that can speak to an unlimited number of circumstances. Imagery of animals, the elements of nature, and other potent symbols will touch you deeply so that a soulful dialogue about your life can take place. The Enchanted Map Oracle Cards were created in order to empower you to understand the story of your fate, destiny, and free will; and allow you to chart a course to live a life of deep purpose, true prosperity, and vibrant love. Step into the Enchanted Map . . . and watch the magic come alive! Grounded in a divination system that dates back centuries, The Good Tarot has a psychic architecture that’s more simple and modern, rooted in contemporary positive psychology and aimed at the expression of the highest good for all. The 78 cards in the deck are read as archetypal aspects of the human experience that we may encounter within ourselves, with others, or in the world. The suits in The Good Tarot are the four elements, with Air standing in for the traditional Swords, Water replacing Cups, Earth for Pentacles, and for Wands, Fire. A crucial difference from traditional decks is that the cards’ messages are all written as positive affirmations in the present tense, rather than forecasts, instructions, or warnings. Those who use the cards in the suggested way can integrate their energy immediately and personally. Wisdom Of The Hidden Realms. Mystics have passed down stories of magical realms hidden from mortal sight, bridging the world of Nature and Spirit. Even before the written word, the ancients established a Divine partnership between humans and these Hidden Realms. Both agreed to form an eternal Sacred Alliance to establish harmony and balance between the material and the spiritual. These cards represent some of those realms and their Queens and Kings, Princes, and other magical helpers. Let the Swan Queen point the way to transformation, the Arrow Master help you reach your goals, the Sun Dancers herald your victories, and the Sacred Union speak to the depth of your longing for love. Ask and ye shall receive, for the Highest Good is their motto. If you call upon them, they will answer. The Wisdom of Avalon Oracle Cards by Colette Baron-Reid is a 52-card divination system-an inspirational tool to bridge the unseen world of Spirit and the physical world of our day-to-day lives. Based on the rich mythology of ancient Britain’s Isle of Avalon and the wisdom teachings of its priestesses, these cards will help you find a valuable and powerful insights in all aspects of life as you chart your path and manifest your destiny with clarity and purpose. Their use will shed light on what has been, what needs illumination in the present, and what will weave patterns into the future. The deck will help you discover the potential of your own intuition as you follow the omens and symbols of the Goddess, the Kingdom of the Faeries, Merlin, and the Priestess of magical Avalon. See into the future …and discover that you are more than you know! The Oracle is a way to connect with higher wisdom about your life and reflect upon where you’ve been and what you may have learned there, where you are now, and which direction you’re heading. Make this deck your friend and allow the Oracle to help you gain wisdom and knowledge about your choices and their consequences, the best use of your thoughts and intentions, and the next right action for the highest good of all. This 52-card deck and companion guidebook will allow you to interpret her messages about all aspects of your journey, with over 250 independent meanings that can speak to an unlimited number of circumstances. The Oracle is waiting for you to consult her so you may receive answers and know the way forward to peace, purpose, prosperity, and love! These positive, relaxing meditations guide you through affirmations and vision journeys that help inspire you to pursue your passions. These vision journeys are guided meditations that lead you through calming nature scenes and soothing nature music. I was inspired to create these guided meditations with themes such as “Crystal Cave” and “Sound of the Sun” and meaningful topics such as “The Magical Power of Forgiveness” and “The Map of Fate and Destiny”. The app is designed to make your meditation experience super easy too! And it even has convenient features such as the ability to set a daily notification, custom playlists, sleep timer settings and more. Isn’t that awesome? Listen, if I can meditate so can you! I promise you will be happy with the results. These positive, relaxing meditations guide you through affirmations and vision journeys that will benefit you in your daily life, as you seek mindful living. I have created this meditation app to help you begin a meditation practice, deepen one you have, or provide variety in your meditation journey. I have made these powerful and effective meditations available to you so that you can easily create more stillness in your life on a daily basis. With meditation as a daily habit, you will be amazed at the powerful changes you create in your life. I’ve done it! Meditation has helped empower me in so many ways… and if I can do it, so can you! Make meditation the habit that changes you. These positive, relaxing meditations guide you through affirmations and vision journeys that help inspire you to realize your inner magic. The app contains five free meditations available to everyone and eleven exclusive meditations only for Oracle School students. Alberto Villoldo, Marcela Lobos, and I have teamed up and combined our wisdom and talents together to create this new oracle deck, now in an easy to use app. Alberto and Marcela contribute their decades of knowledge and experience with indigenous shamanic practices; I offer my extensive expertise with divination tools. The result is an oracle deck app unlike any other currently on the market, featuring cards with powerful beings, animals, and natural forces from cultures across the globe; along with useful, easy to use features. Only available in the App Store for iPhone and iPad. Embrace positivity and loving guidance with the empowering app, Your Daily Oracle, an app that can enrich your life and the lives of those around you. There’s never been an easier or more personal way to receive daily Oracle guidance. This is a one of a kind app, the only one with direct audio guidance from me in my own words and my own voice. – Your DOMINANT ENERGY for the day. – What you are MOVING TOWARD!! ‘Your Daily Oracle’ can be used forever absolutely FREE but you don’t want to miss the bonus readings and features included in becoming a VIP subscriber. Get it today and enjoy free bonus meditations only available in the app. This is an amazing oracle deck app of interactive conversations with Spirit based on the energy of goddesses from ancient traditions around the world. Get a 7-day RISK FREE Trial to The Goddess Power Oracle Cards! Striking, elegant interpretations of 52 goddesses from cultures all over the world await you in Goddess Power Oracle. Elen of the Ways call you to your path . . . Artemis offers to guide your arrow . . . Cerridwyn urges you to trust in the unlimited potential of your life . . . bridge the mundane and the mystical and be guided on a journey of self-empowerment and fruitful manifestation. Where are we going? How will we get there? In a world of uncertainty, most of us don’t really know. Our challenge is to sail into uncharted waters—away from the familiar ways that don’t work anymore—to discover ourselves and the infinite potential for our lives. It’s in these as-yet-undiscovered places within us that we come to recognize what we can be and what we can co-create with Spirit. If we try to create guided only by the old, familiar map of our lives, what we create won’t be authentic to who we are becoming; we’ll just be doing the same thing over and over. As intuitive counselor and “spiritual cartographer” Colette Baron-Reid explains, we need a different kind of map—not one that tells us where we’ve been, but one we fill in as each new experience changes us into who we need to be to live our destiny. This new map is a map of the soul. In Uncharted, you’ll learn to draw your own map of the soul as Colette guides you on an inward journey through five interconnected realms. First you’ll get oriented in the Realm of Spirit, your “home” that connects the other four. Then you will do the work of self-evolution and co-creation in the Realms of Mind, Light, Energy, and Form. In the Realm of Mind, you experience your consciousness intermingled with that of all Consciousness. In the Realm of Light, you illuminate the darkness and experience transformation as you reclaim lost parts of yourself. In the Realm of Energy, you consciously direct the forces influencing you. In the Realm of Form, you see the results of your self-evolution manifested in the material world. At every step, you learn to harness your personal power and turn fear into possibility as you venture into the undiscovered places where magic happens. Intuitive counselor Colette Baron-Reid is renowned for helping people create the purposeful and authentic lives they desire. In this fascinating book, Colette hands you the “magic wand” of your own awareness so that you can begin to perceive your life as a wonderful adventure, and see yourself as an enchanted mapmaker. Enter a deep journey into your inner landscape and meet the imaginary beings that hold the keys to the wisdom hidden in your subconscious: the Wizard of Awareness, the Gentle Gardener, the Bone Collector, and the spirits of the psychological terrain you traverse, who know where to find the treasure in each experience. Discover how to tame the mischievous trickster Goblin, who locks you into old habits. Each of these aspects of your psyche has lessons for you, and each responds to your directions, for you are in charge of your own map. You don’t have to feel lost or disoriented in this time of global transformation, or be at the mercy of the winds of change. The Map invites you to boldly claim your power to direct your journey so that you may find meaning, purpose, and joy. Step into the magic, and harness the extraordinary power within you to shape your destiny. By exploring ancient methods in a modern context of connecting to the Divine, renowned intuitive counselor and best-selling author Colette Baron-Reid shows you magical, fun, and practical methods that will enable you to delve into your own dialogue with Spirit. She’ll take you on a mysterious and enlightening journey that will shake up your perspective, stir your curiosity, and prepare you for a Divine conversation that will forever change your understanding of the world around you. Over the past 17 years, Colette has amassed an international client base that spans 29 countries, while offering astonishing personal insights that many consider miraculous. She now openly and generously shares that journey in Remembering the Future, which will not only leave you filled with hope and empowerment but will guide you in rediscovering your magical gift of intuition. Spirit is speaking to you always and at every turn, whispering messages of Divine guidance and love. Spirit is just waiting to give you help whenever you ask for it. You just need to enter the conversation and understand the dialogue. On this CD program, renowned intuitive counselor and best-selling author Colette Baron-Reid shows you how to ask for and receive the life-affirming gift of guidance that is always available to you, as she dispels the myths and misinterpretations that may have kept you from embracing your inner “oracular” consciousness. All of the stories, exercises, and ideas in this comprehensive four-part program (which includes a complementary workbook) are designed to make you more receptive to the messages and signals from Spirit that appear every day in a multitude of ways. Sessions 1 and 3 explain what the world of oracles, omens, and signs is all about and how to experience them in your own life. Sessions 2 and 4 are filled with powerful and experiential “vision journeys”’ or guided meditations, which will facilitate your personal ongoing connection to Divine guidance. Once you ignite your capacity to receive messages from Spirit, your world will never be the same! Internationally renowned spiritual intuitive/recording artist Colette Baron-Reid has used the guided meditation on this CD as the foundation for intuitive development in her seminars and workshops. 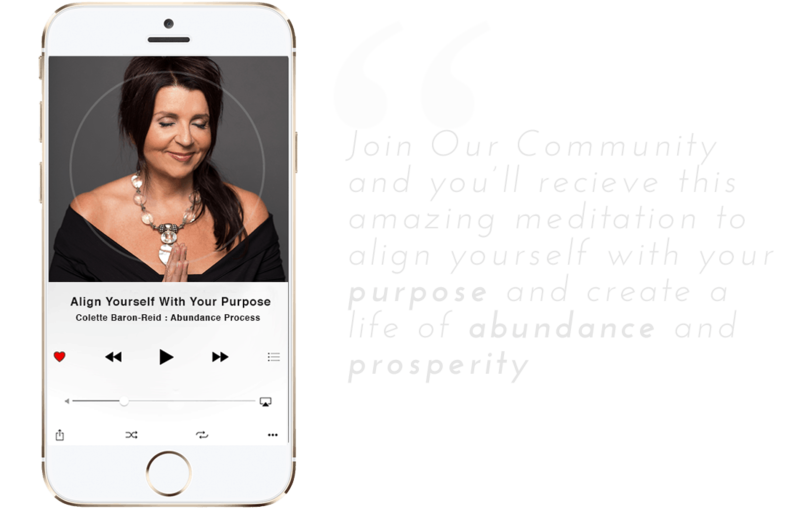 She created this program with the intention of taking you, the listener, on a creative-visualization exercise—a journey through the chakras, the seven steps of ever-expanding awareness. Starting at the first chakra, with its corresponding gemstone, and then traveling through each subsequent chakra, you’ll be able to clear, reenergize, balance, and restore these powerful energy centers, resulting in an overall sense of well-being.